Toro Rosso Formula 1 team principal Franz Tost says the drivethrough penalty Daniil Kvyat received after a clash with McLaren's Lando Norris in the Chinese Grand Prix was "unjustified". Norris had run wide at the entry to Turn 6 on the first lap and was straddling the kerb at the exit. Sainz was sandwiched between Norris and Kvyat and, when Kvyat's rear-left hit Sainz's front-right, the Toro Rosso driver was pitched left into Norris on the outside. The stewards noted that Kvyat had "lost control of his car at the exit of Turn 6 and hit the cars to his left. He did this on his own and the stewards determined that he was wholly at fault, causing the collision". They awarded him a drivethrough penalty and two points on his license. Both McLaren drivers pitted for new front wings, Sainz taking 14th and Norris 18th. "This penalty for me is unjustified," Tost told Autosport. "Norris was off the track, and he came back very aggressively, so what should Daniil do? "For me, this decision is not correct. "You can't change it, but Daniil and Graham [Watson, team manager] went to the stewards to tell them that this is our opinion, and I share this opinion because I watched it on TV once more just now with the engineers. "It cannot be that someone is off the track, is coming back, and then the other one is there. What should he do?" Kvyat lost more time when front wing damage was spotted at his scheduled stop and the team decided to pit him again and change it. When it was clear that he would not score any points the team stopped the car. "We retired him because we wanted to save engine mileage," said Tost. "The regulations say only three engines. So instead of running the car out on the track, we decided to call him in." 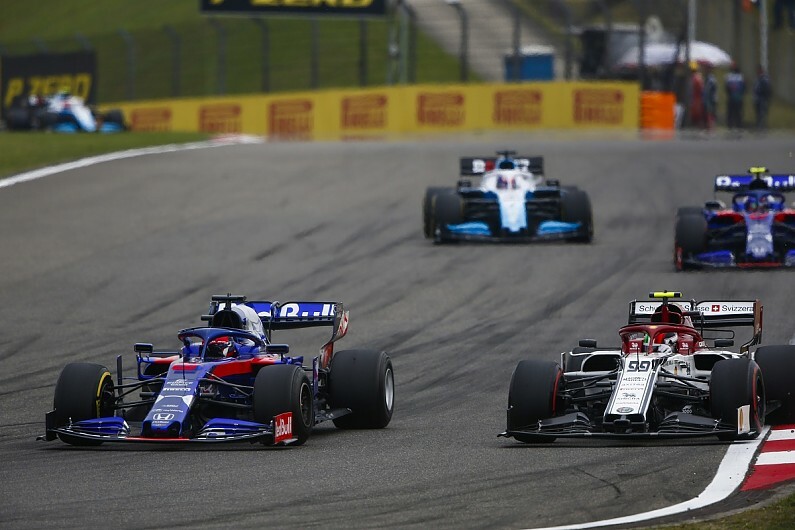 Tost also said he told Alexander Albon to be aggressive after starting from the pitlane in the Chinese Grand Prix - and he says the rookie drove a "perfect race" on his way to 10th place. Rather than go for a conservative strategy and long opening stint STR gave Albon a set of new soft tyres for the start. He managed to do 19 laps before switching to the hard tyre for the run to the flag, subsequently staying ahead of drivers who stopped twice. It was his second consecutive top 10 finish. "I'm really happy with his performance and how he drove this race," said Tost. "It was a perfect race, without any incidents, and also his overtaking manoeuvres during the race were very good. "It was a well-deserved point because from Friday onwards he showed a good performance with the car. "I said to him be very aggressive. Starting from the pitlane, what do you want to do?